A young ensign had nearly completed his first overseas tour of sea duty when he was given an opportunity to display his ability at getting the ship under way. With a stream of crisp commands, he had the decks buzzing with men and soon, the ship had left port and was streaming out of the channel. The ensign's efficiency has been remarkable. In fact, the deck was abuzz with talk that he had set a new record for getting a destroyer under way. 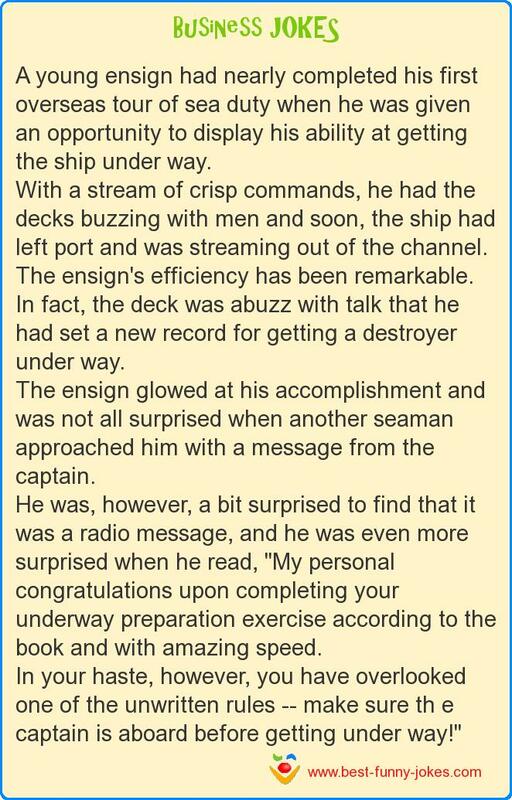 The ensign glowed at his accomplishment and was not all surprised when another seaman approached him with a message from the captain. He was, however, a bit surprised to find that it was a radio message, and he was even more surprised when he read, "My personal congratulations upon completing your underway preparation exercise according to the book and with amazing speed. In your haste, however, you have overlooked one of the unwritten rules -- make sure th e captain is aboard before getting under way!"